The planetary positions (without the Moon) at 12:00 EST on December 21, 2012, are shown in the PAT image below at left. There are (with the PAT default values for orbs) a total of 15 aspects: 2 conjunctions, 2 oppositions, 2 squares, 2 trines, 3 sextiles, 2 semisextiles and 2 quincunxes. 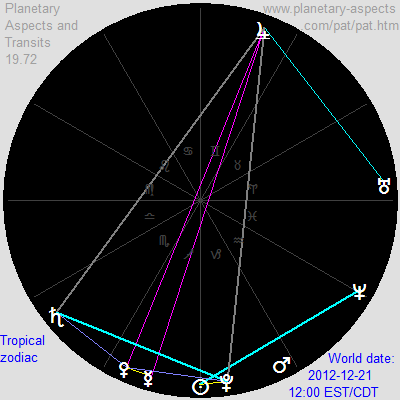 A close-to-exact yod-kite is present, involving Saturn, Jupiter, Pluto and Venus. There is one midpoint: Jupiter is exactly between Saturn and Pluto. When the lines showing trines (green) and squares (red) are removed it is easier to see the yod-kite. A very different planetary configuration is revealed when we adopt a heliocentric perspective, as seen in the HPAT image at right. There are (with the HPAT default values for orbs) a total of 15 aspects: 3 conjunctions, 1 opposition, 2 squares, 7 trines, 1 sextile and 1 quincunx. 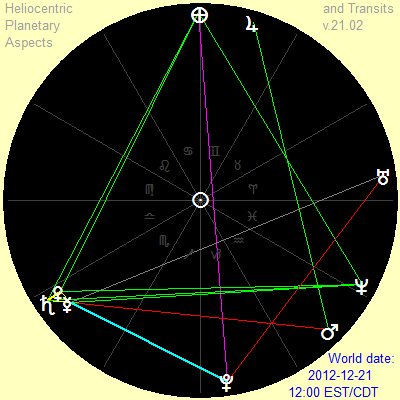 Two grand trines are present: Earth-Venus-Neptune and Earth-Saturn-Neptune. A 3-stelium is present: Mercury-Venus-Saturn. There are two midpoints: Neptune is exactly between Earth and Venus, and also exactly between Earth and Saturn. There are no aspects common to both the geocentric list of aspects within 3° of exact and the heliocentric list.